Walking to Pluto with Kids. This is the Year of Pluto and Lowell Observatory in Flagstaff, Arizona where Pluto was discovered is celebrating the 85th anniversary in cosmic style and walking to Pluto is only part of the fun. An artful cosmic cat guards the Pluto Telescope at Lowell Observatory on Mars Hill above Flagstaff, AZ. I have always had a soft spot in my heart for Pluto because when I was in the fifth grade I played the tiny planet in a science fair skit. I knew then as I know now Pluto is small and its orbit erratic but the demotion to dwarf planet seems a little demeaning but no one asked me to vote. My family has found memories of visiting the Observatory when Pluto was still at the end of the planet chain. Mars Hill was then and is now a cool place. 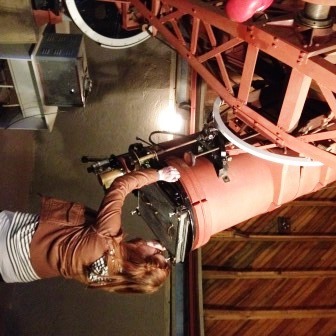 Not able to let go of our love for Pluto, a few weeks ago my daughter and I revisited Lowell Observatory atop Mars Hill. The last time we were there she was eight years old and Pluto was still a planet. She remembered the famous telescope as being bigger and the walk much longer – no surprise. 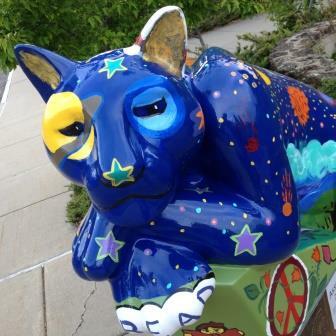 The famous750-acre hilltop facility, guarded by a cosmic blue cat is quietly impressive. It’s a place where real scientific research is being conducted and yet the public has access to scientists who willingly answer questions about planets, star clusters, and cosmic disorder. While there are more than a dozen solar system walks spanning the continent, this Lowell Observatory hilltop complex is the best place on the plant to walk to Pluto with your kids. The official the Pluto Walk spans 350-foot (107- meter) and follows a path illustrating the scale of our solar system planet by planet with tiny Pluto at the end. Just steps beyond is the Pluto Discovery Telescope (actually an astrogragh), one of the most famous telescopes in the history of American astronomical research. Within the hilltop complex there are plenty of cosmic connections, including stargazing to be enjoyed but for us walking to Pluto’s was the best.